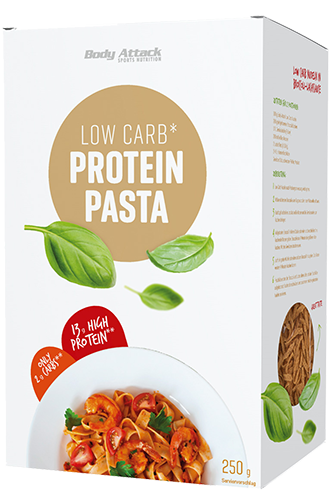 Body Attack Low Carb Pasta - intended for people who like to eat pasta dishes & pay attention to a healthy and protein-rich diet. Enjoy JabuVit Low Carb Pasta. The pastas of Body Attack not only taste delicious, but have a high protein content of 65 to 100 grams. Athletes, in particular, strength athletes, need a lot of protein, which is found in meat, fish, dairy products or soy. With an increased demand, e.g. during several intense workouts, this protein can be supplied easily to the body by Body Attack Low Carb* Pasta. This product not only helps maintaining but also building up the muscle mass if worked out regularly and persistently. The product is suitable for all people who pay attention to a healthy diet and take very less carbohydrates. People who are on a diet can easily cover the protein requirements with these pastas, as well as eat healthy and tasty food. Those, who do a lot of exercise, especially weight training, and want to eat sensibly, can include this Body Attack Low Carb Pasta often in their diet with a good conscience. This is especially true when one loves to eat pasta and pays attention to the carbohydrates. What are the low-carb pastas of Body Attack composed of? The protein of the low-carb pasta comes from peas and eggs; thus, it is of vegetable and animal origin. Furthermore, Body Attack uses wheat gluten, its products and inulin from chicory root for the low-carb pasta. The Body Attack Protein Low Carb Pasta tastes good and keep one satiated, and the feeling of hunger does not recur so fast. It is as simple to cook them as regular pasta - boiled in salted water seven to ten minutes and then served with a delicious sauce. In combination with the Body Attack Casein Protein, a particularly satiating milk protein that helps to preserve muscles. With the Body Attack Daily Vital, a multi-vitamin supplement to prevent shortage in the supply of vital substances. Give 50 g of pasta in 1 litre of boiling water, add some salt, cooking time approx. 7-10 minutes, you have to agitate. * min. 30% less carbohydrates than comparable products.